Image: Photo taken about 1940. 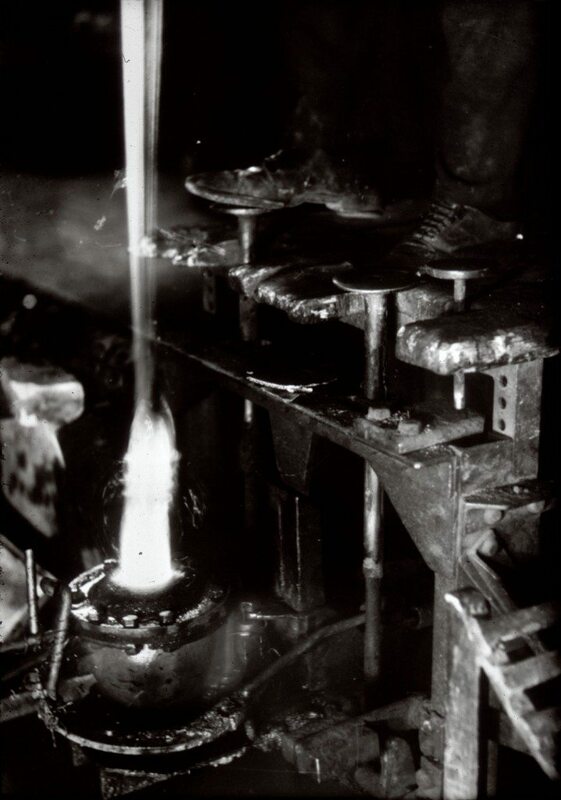 It shows the right foot of the glass blower ready to press the pedal to open the cast iron mould, thereby releasing the glass globe after manufacture. Of the other two pedals, one is for raising the mould out of the cooling water where it had fallen after opening; and the other pedal is for shutting the mould after the glass “gathering” was in position for blowing. This machine can only be used for making globes up to a certain size. Image from: Chance Brothers Glassworks, Smethwick Slides. Broadfield House Glass Museum, Kingswinford, Dudley (Slide and Transcript no 11 by Arthur Reeves).